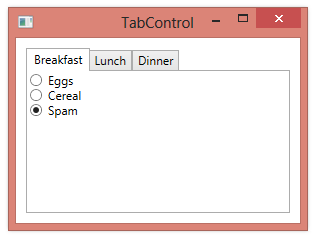 If you like, you can place a group of RadioButton controls on each tab of a TabControl. Because each tab of the TabControl can contain only a single element, you need to place the individual RadioButtons within a container (e.g. a StackPanel) which is then placed within the TabItem. Because RadioButton selection is automatically managed, for all RadioButtons within the same container, this scheme ensures that only one RadioButton on each tab can be selected.